The New York Times recently ran a fascinating account of the arrest and execution of Shan drug lord Naw Kham, who was accused of being responsible for the murder of 12 Chinese boat crew on the Mekong in October 2011. It was 100 miles downstream from China, on the banks of the Mekong River, where a notorious drug lord slipped ashore in the dusk into the hands of law enforcement. 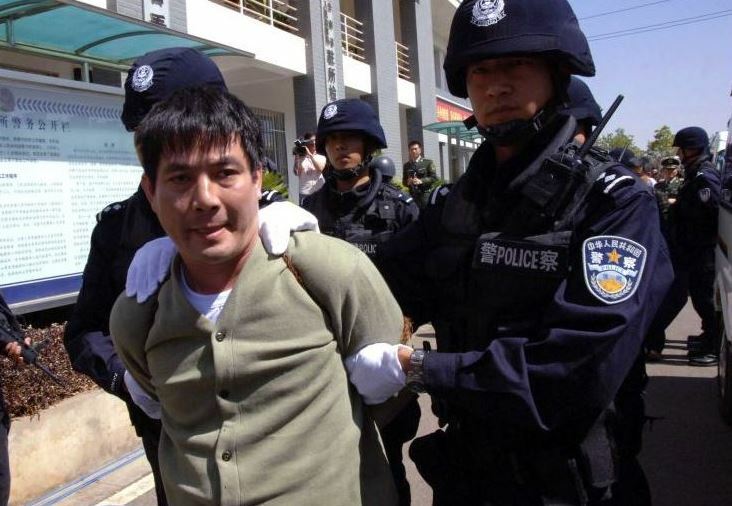 Security officials from Laos arrested the trafficker, Naw Kham, but the international manhunt that led to his capture was organized in Beijing, by top Chinese government officials intent on making him pay for the killings of 13 Chinese. China’s search for Mr. Naw Kham, overseen by its powerful Ministry of Public Security, was a hard-nosed display of the government’s political and economic clout across Laos, Myanmar and Thailand, the three countries of Southeast Asia that form the Golden Triangle. It took six months for China to catch Mr. Naw Kham, a citizen of Myanmar in his 40s, a man of many aliases who was at the center of the booming synthetic drug business in the Golden Triangle, once known for its opium…. [After his arrest] the authorities flew the drug lord from Laos to China, tried him in a provincial court and executed him last month. The Chinese hunt for Mr. Naw Kham was methodical and unyielding. …. Mr. Naw Kham [had proven] to be a formidable target…. In the beginning, the Chinese had no idea of Mr. Naw Kham’s whereabouts, and did not know on which side of the river he was hiding. Gradually, they began picking up his tracks. As Mr. Naw Kham’s security net evaporated in Myanmar, the Chinese learned that he planned to escape across the Mekong River to Laos in a small boat, Mr. Liu said. The Laotians were alerted… Mr. Naw Kham landed on the muddy banks with two associates. Police captured him as he tried to flee. Naw Kham’s story is an excellent illustration of the relationship between local power and state power in the Mekong borderlands of Asia. He was arrested in the village of Ban Mom which, in the 1980s, briefly prospered as a trading conduit between Thailand and Laos. With the Thai-Lao border closed, Thai traders would take their goods through Burma and cross the Mekong to the muddy market of Ban Mom where they would sell to Lao traders who had made the upstream journey from Houayxai and Luang Phrabang. Many of the Lao traders I worked with in the mid-1990s established themselves by taking advantage of the lucrative opportunities created by uneven regimes of regulation in the Thailand-Laos-Burma borderlands. This is all well and good, and it tells part of the story. But Naw Kham’s infamous exploits remind us of another mode of interaction with modern state borders. Since modern borders were first established, opportunists like Naw Kham have used them to pursue their own economic and political agendas. Far from limiting their ambitions, modern borders have given local strongmen a new resource that they could draw upon in their attempts to exert local and regional power. Long before Naw Kham, another Shan war lord, Twet Nga Lu, created much greater havoc in the upper Mekong region. Even in the 1880s, Twet Nga Lu knew that emerging ideas about demarcated borders and exclusive sovereignty granted him protection when military force failed him. He deliberately crossed into Siamese territory, knowing that the British and their Shan supporters would be unwilling to pursue him there. He regrouped his forces, secured arms in Chiang Mai, and launched another attack on his Shan rivals. Merely crossing into the territory of a neighbour denied his enemies the power of pursuit. This was to become a powerful realisation in the history of the borderlands. Borders represent a quite idiosyncratic form of state authority: merely stepping across them can subvert the power of one state by invoking the authority of another. Rebels and smugglers are regularly portrayed as the enemies of modern borders. But, in fact, they depend on modern state demarcations for their lives and livelihoods. To counter Mr. Naw Kham’s web of protection, China was able to rely on contacts developed over the past decade from the training of more than 1,500 police officers in Southeast Asia, the official said. China also had an array of informers – “flip-flops,” the official said – from among the increasing number of Chinese petty traders and businessmen in the region. “He had his people, we had our people,” acknowledged Mr. Liu [leader of the antinarcotics bureau of the Ministry of Public Security] in a rare interview with a foreign reporter in his office in Beijing. … Mr. Liu denied having his own men on the spot [when Naw Kham was arrested], but it was almost certain that Chinese agents were on hand. Drug warlords are a dime a dozen in that region! Interesting article with many ramification by Mr Walker. Especially with the general knowledge of Golden Triangle. The Chinese society has ALWAYS regard consumption of drug as a socially acceptable right if not a status especially among the effluent, as long as the users are functional. Naw Kham is a 3rd generation drug-lords (mind the ‘s’) with WA and Shan support. From his feature one can almost ascertain that he IS also part Chinese, undoubtedly at least partially a KMT descent. Providing another source of income while serving the societal demand. This will be no doubt a one time deal due to Nam Kham violating the ultimate rule of “Thou shalt not kill any official”, let alone quite a few, in this case, instead of bribing them generously, especially within China. Assuring from now on that rest pay up ahead or else. Thus maintaining the balances of ying and yang, again. Smart drug lords that vested within China, Lao, Myanmar and Thailand will continue to enjoy Khun Sa fate. Anyone who believe China will reciprocate if the culprit within China is a Chinese, taking advantage of the borders as Naw Kham did? This is one example of shame in the Shan State of Myanmar nation state. A long time of political oppression and armed conflict that were successively exercised by previous regimes and various armed groups have produced many unwanted. I feel pity on many innocence citizens who live a lawful and legitimate life in the local but who also have to bear such a burden of crime (and bad name) committed by other unscrupulous few. When will the eastern Myanmar become a land of peace and prosperity where children can go to school and parents do not have to worry that their children will come back home safety every evening? I’ve always had severe reservations about that whole boat incident. To this day I doubt Mr. Naw Kham was guilty the piracy. Sure would be nice to have heard from the Thai policemen who did the deed under contract.